Robohub roundtable: Robotic bee swarms from Black Mirror – what’s hype, what’s real? In this roundtable edition, we watched the Black Mirror episode “Hated in the Nation” and asked our Robohub team members: with many institutions focused on developing aerial drone technology, and in light of the pressing reality of climate change and bee colony collapse, do we see robotic bees in our future? Would swarms of artificial insects even be desirable? Still. Whoever said it, it’s a haunting prophecy. With climate change thought to be forcing colony collapse disorder and threatening the existence of many pollinators, might swarm robotics hold the key to humanity’s survival? Could these robot bees ever be hacked to spy and become weaponised? In our roundtable we discussed the technology in the Black Mirror episode “Hate the Nation” and some of the pitfalls. Swarms of autonomous, 3D printed drone bees pollinating the nation. Hackable AI, vulnerable to attack. Flying tools turned aerial enemy. Do our experts think any of this could happen? Is this type of technology likely or even feasible? Sabine: What’s interesting is that not everything in the episode is entirely crazy. We do want to create technology that addresses a specific need. If there are fewer pollinators, we might want to create artificial pollinators, though not necessarily artificial bees, to help us along the path to addressing the issue. But I think the technology in Black Mirror is very far from something we can do today. There was a project called RoboBees, that was Harvard-based, that was all about creating artificial bees for pollination—so exactly this scenario. There were multiple parts and problems: how do you make very small flyers; how do you drive them in a controlled way; and how do they sustain enough energy. All these things are extremely hard to address. They’ve managed to make some of the world’s best miniature flyers that can flap their wings and take off, and are making some great steps in controlling them. But when I say control, I really mean turning left and right in a laboratory setting. If you were to put them outside in a windy environments, it’d be a completely different story, and they don’t really have the energy to go very far. And then there’s the algorithms. It’s not just the bees in this episode, they’re all connected to hives and they have all these control algorithms implemented that allow them to find flowers and people with image processing. How do you get such large numbers of drones to communicate with each other and their hubs? There are multiple communication issues that are very hard to address. 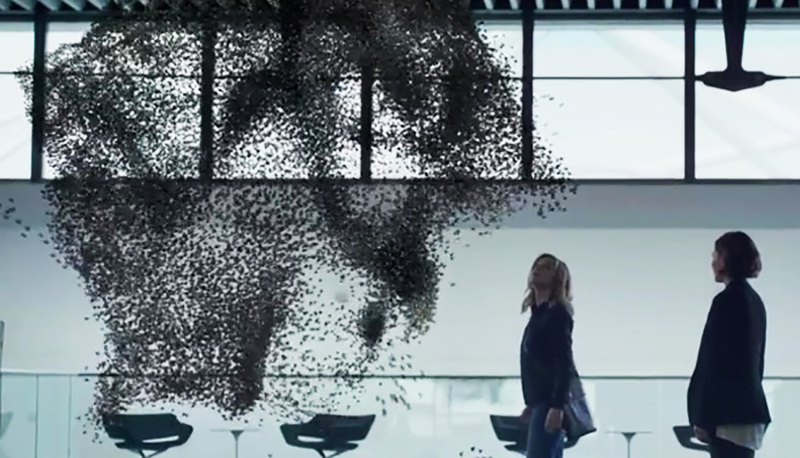 What is interesting is that [Black Mirror] put together these bees with the swarm approach, and the pollinate in a way that’s very bio-inspired. Kassie: Does anyone think that this episode did a disservice to swarm robotics in that someone was able to hack into the mainframe and essentially attack and kill people? That’s a very real fear that people have with regards to robotics and AI. Sabine: For years we had to answer the question: Have you read “Prey”? Is this likely to happen? And now it’s: Have you seen “Dark Mirror”? Ioannis: In fairness, there is some justification for this, as opposed to questions about terminators and things. Sabine: And it’s not the technology [in Black Mirror] that’s the problem, it’s the humans. The technology starts by being portrayed as a real positive. All the tech in this episode, like the autonomous cars, is actually really cool and helpful. It’s the people who screwed up, ultimately, and the system got hacked. So I think the key message is that we need to make the technology secure. Ioannis: Did you think it was a little short-sighted in the way it portrayed swarm robotics? It sounds very inefficient to me to have a central control that’s required to monitor the flight of every bee. All the bad guy needed to do was hack the central control to manipulate every bee. A swarm is something different than a million drones. In the episode, it looks like a swarm, but in reality it’s actually a lot of remotely operated robots. Sabine: That’s right. And if it was properly decentralised, it would have been harder to hack because you wouldn’t be downloading massive amounts of code on every one of these bees. Ioannis: To make the swarm go from controlled to bad, the hacker could have introduced some kind of memory or code to enable the swarm to evolve rapidly, and from that point on it’s out of control. That would have been interesting. Instead, the hacker just uses the bees as lots of tele-operated robots. I found the episode a little disappointing in this aspect. Kassie: If you’re doubting robotics in any way, this episode is perhaps something you could look at and think: “Oh my God, this is something that could happen.” But I took some positives from this [with robotics] then only negatives. Sabine: I felt the autonomous cars were positive; similar to what you’d expect them to be like in 30 years or so. Ioannis: They portray autonomous cars as being cool, also, which is one aspect. But the fact that the cars are autonomous is nothing [to the story], the characters just use them, which I think is quite cool actually. They ignore the fact that these could be anything futuristic which I think is good. Kassie: It was almost a precursor to something that could actually happen soon, in that some people were still driving, but the people with money had autonomous systems. And it wasn’t portrayed as scary! So I agree that that was a good aspect. Sabine: I think the point of Black Mirror is very often not the technology but that people misuse it, and they make a very good point about online bullying [in this episode]. Ioannis: Yes, and they do not portray online bullies in a stereotypical way. For example, there is a teacher character who is a very nice lady in reality, but online is something completely different. Sabine, I’d like to ask you what you think about the potential of a weaponized swarm for defense purposes? Sabine: I think it’s a very bad idea to weaponize swarms. You have to think about such things as stability and payload, accounting for wind and conditions etc. How would you do that? And why use a swarm as opposed to another type of robot with another type of payload? Ioannis: I don’t have any specific examples for swarm robotics, but in nature a lion is dangerous, and so is a mosquito. Both in different way. So there could be an application. Sabine: In that sense, you can weaponize anything. It’s just so much harder to weaponize a swarm than a more capable system, at least today. Ioannis: What did you think of the robo-bee design? Sabine: I think it was pretty cool, but too complex. If you were to design a robo-bee you would design something like a mini-copter that would sit on a plant, rather than something that looked like a bee. Or you might have an agriculture robot that simply goes across fields and does the pollination. Although the nice thing about the bee design is that the infrastructure is still already in place—plants etc.